A game of golf should be a relaxing and enjoyable day spent in the great outdoors, particularly when you are hitting the ball well and sinking putts. However many players give themselves an uphill battle to get the best out of their round by neglecting some of the simplest of fundamentals. One such fundamental is not drinking enough fluid – something that is exacerbated by the fact that golf is played outdoors and more often than not, in warm temperatures. Dehydration can have a dramatic effect on both your physical and mental performance. Just a loss of 2% of the body’s optimal fluid levels is considered dehydration in its mildest form. 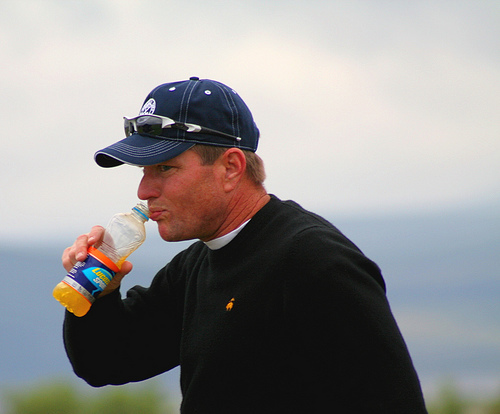 This small amount of dehydration can cause a player to experience physical discomfort, fatigue and drop in judgment and concentration, none of which are ideal when trying to aim at the flag and improve your handicap. If you are someone who does not drink much fluid while on the course, try weighing yourself immediately before and after your game - the drop in weight due to a loss of body fluid may surprise you. Because even a small loss of water can be destructive to an athletic performance, a good hydration plan is vital. Dehydration occurs when the body’s fluid loss exceeds the fluids being taken in, and, apart from an illness, the most common reason for dehydration is not drinking enough fluids or drinking the wrong types of fluids. Everyone is different when it comes to hydration, however here are some simple strategies that may help you. Take enough water with you to last the whole round, and aim to drink a minimum of 250ml per hour as you move around the course.